Will somebody please tell me how a country shuts down its government? 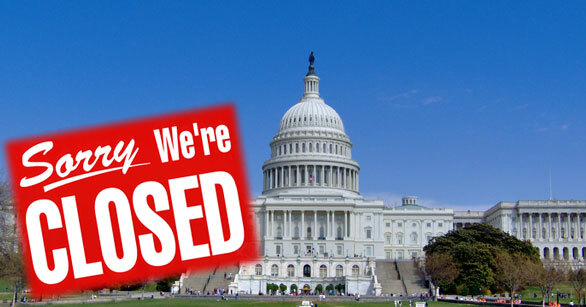 Does shutting down the government mean that it no longer needs to exist or that government is no longer necessary? What does it mean when the President of the United States lifts the sanctions on a Russian Oligarch from a country responsible for hacking into our elections and then punishes its own government workers by putting them out of work and in some cases forcing them out on the streets because they can’t pay their mortgages? Is the President weaponizing his resentment toward the American people because Democrats won’t give him his wall? What does it mean to our enemies when the FBI, other law enforcement agencies, soldiers and military so essential to guarding and protecting our democracy must stand in food lines to feed their families because they are not being paid? How long will airports and skies be safe with fatigued air traffic controllers and Transportation Security Administration workers still faithfully working double-time, triple-time, quadruple time and time in a million time without pay? What does it mean to government employees, contract workers and people dependent upon government checks and other financial support for medical care, education programs, food stamps, housing and other subsidies when our government is shut down for an extended period of time? Does shutting down our government mean putting our nation at risk? Does shutting down our government mean that current government investigations will stall out? Does shutting down our government mean that nobody’s home, that nobody’s keeping watch, that nobody gives a tinkers damn about the present and future state of American Representative Democracy? Is shutting down our government a dress rehearsal for devaluing, discrediting and eventually decimating our present form of government? Does shutting down our government mean turning it over to thieves, wolves, predators and other rapacious, vulturous parasites seeking to make America their breakfast, lunch, dinner and happy hour snacks? Again, will someone tell me how a government shuts itself down? How do persons responsible for enabling, building, creating, securing, beautifying, growing, upholding, serving, sustaining, strengthening, protecting, pruning, defending, renewing, restoring, replicating, reforming, revitalizing and revolutionizing their government decide to close it down, or stand by silently and watch it being closed without even a cat’s snarl, a gnat’s murmur or a rat’s whisper of protest? How does the most important institution in the world shut itself down? How does the government of the United States of America just close up shop, pull down the shades, lock its doors and put a gag order on itself? Will somebody please tell me how politicians decide to shutdown government business for a time when it is their primary business to stay in business all the time? To use a biblical analogy, is the lead “shepherd” called to bleed out all over his own sheep? So you hate America and your government so much that you would shut it down even for this woe begotten period of time of month(s), days, weeks- or even a black second or milliseconds of time? Since our government is now shut down, does this mean that American Democracy is now on suicide watch or does it mean that in the end there will be someone there to turn the lights back on for us?